Wholesale Custom Car Shades -Sun Protectors for Side Windows, Personalized or Blank. Budget Prices in USA and Canada. Silver Nylon Mesh with Blue, Red or Black Trim. 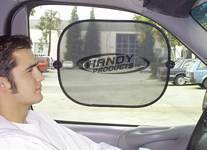 Bulk Personalized Side Window Sunshades at deep discount prices. Protect your passengers from extended exposure to the sun with our nylon mesh Side Window Shade. Collapses for easy storage and mounts onto any window using 2 suction cups. Lowest cost in the USA and Canada for wholesale personalized car shades. American clients pay no taxes. Free artwork design. We will send you a proof for your approval before production. We also supply bulk blank (not imprinted) car side shades: see the Price Table below. All prices include your one color custom imprint, or they are for blank (not custom imprinted) bulk side car shades. 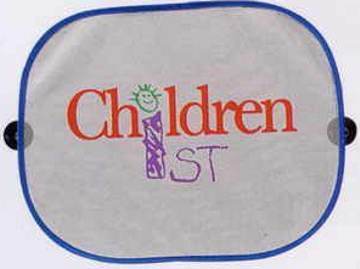 - Extra imprint color: add $0.50 per color, per car shade. Production Time: 7-10 days after art approval; Rush 3-4 days production is available: contact us. Blank (not custom imprinted) car side shades ship next day. Please Multiply all US prices by 1.30 to get the CAD$ prices. Material: high quality dense nylon mesh. Imprint Area: 11" X 9"
Colors: Silver Nylon Mesh with Blue, Red or Black Trim. See through nylon mesh reduces glare & sun light. Easy to use, Easy to fold, Easy to store. Folds to a 7" diameter disc. Each panel includes 2 clip-on suction cups. Great for passengers and children. Please check also our wholesale personalized sunshades for car windshields .